Governing Europe's Marine Environment is a coherent up-to-date multidisciplinary analysis of current approaches and challenges to the sustainable governance of Europe's marine environment. Structured in three parts, Part 1 outlines general theoretical ideas about governance, governing, and governability and serves as a starting point for analysing the development of marine governance in Europe from the perspective of different disciplines. Part 2 includes studies of EU marine governance. Part 3 focuses on Europe's regional seas, namely the Baltic Sea, the North Sea, the Black Sea, and the Mediterranean Sea. 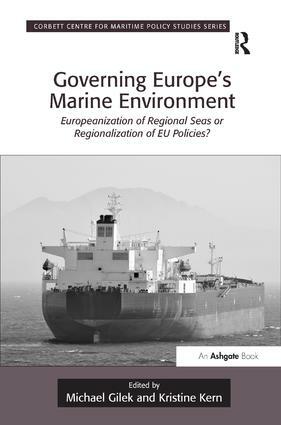 This book presents a better understanding of the fragmented governance of marine governance in Europe and in particular the tension between the Europeanization of regional seas and the regionalization of EU policies. Contents: Preface; Governing Europe’s marine environment: key topics and challenges, Kristine Kern and Michael Gilek. Part 1 Analytical Perspectives on Marine Governance: The ’new’ marine governance: assessing governability, Svein Jentoft and Ratana Chuenpagdee; Marine governance: institutional capacity-building in a multi-level governance setting, Jan P.M. van Tatenhove; Float or sinker for Europe’s seas? The role of law in marine governance, Brita Bohman and David Langlet; The ecosystem management approach: implications for marine governance, Monica Hammer. Part 2 Marine Governance of the European Union: The Marine Strategy Framework Directive as a catalyst for maritime spatial planning: internal dimensions and institutional tensions, Elizabeth De Santo; The Regional Advisory Councils in European fisheries: an appropriate approach to stakeholder involvement in an EU integrated marine governance?, Marion Dreyer and Piet Sellke; Science and policy in the governance of Europe’s marine environment: the impact of Europeanization, regionalization and the ecosystem approach to management, Michael Gilek, Mikael Karlsson, Oksana Udovyk and Sebastian Linke. Part 3 Marine Governance of Europe’s Regional Seas: Marine governance in the Baltic Sea: current trends of Europeanization and regionalization, Sara SÃ¶derstrÃ¶m, Kristine Kern and BjÃ¶rn Hassler; Marine governance of the North Sea: patterns of regionalization, Jan P.M. van Tatenhove and Judith van Leeuwen; Marine governance in the Mediterranean Sea, Juan LuÃ­s SuÃ¡rez de Vivero and Juan Carlos RodrÃ­guez Mateos; Marine governance in the Black Sea, StÃ¥le Knudsen; Marine environmental governance in Europe: problems and opportunities, Michael Gilek, BjÃ¶rn Hassler and Svein Jentoft. Index. Michael Gilek is Associate Professor in Ecology/Ecotoxicology at SÃ¶dertÃ¶rn University and has extensive research experience on chemical pollution and other ecological risks in the aquatic environment, as well as on associated science-policy interactions. In his current research he leads international interdisciplinary studies analysing marine spatial planning and environmental governance in the Baltic Sea. Kristine Kern is Professor in Governance of Urban Infrastructure and Global Change, University of Potsdam and Leibniz Institute for Regional Development and Structural Planning (IRS). Her current research interests are in the areas of local and regional climate and energy policy, sustainable development of cities and regions, transnational networks of cities, European regional seas (Baltic Sea in particular) and the EU macro-regional strategies.